Posted on November 26, 2014	by Rev. Joe Jagodensky, SDS. There it is, now lit. It took longer to light this time because the wick is lower and I just can’t seem to reach deep enough inside to relight it. But I did. The house is still heated, I can’t rely on that little flame to flame forth a comfortable, warm winter home. Heck, if I quickly stood up right now I think it’d go out. Oh wait. Forget that. I just tried it and it didn’t go out; this little, small flame on my kitchen table with a supposed spruce scent that “fills the room” as the box falsely described. I didn’t buy the candle for the scent but for the small flame although a nice scent would be nice. It flickers, ever so slowly as it tries to keep itself alive. The heating wax surrounding it allows the tiny flame to stay lit. Is it enough to turn off the kitchen light? I’m not even trying because it’s a silly question. If it can’t heat, it certainly can’t illuminate. I like the teeny flame because it seems to show everything when its barely shows anything. If folks walked into my kitchen now they would not say, “Oh, what a beautiful flame you have going here.” It wouldn’t be noticed. It would remain an unsaid piece in the room. None would smell the scent as the box described and our conversation would move to topics that interest them. But they are not here. It is just me and a single, miniature version of those real flames that surround a veterans memorial or a park’s statue. My tiny flame doesn’t mark great and grand events but only the passing thoughts that pass my mind as quickly as they enter. Random, varied; none solved or resolved. Perhaps a few reenactments of a personal play that cannot be re-acted run through my mind but it seems productive to try even if the reproduction turns out the same way. It’s my single flame. I can have an opening and closing night in one hour if I want to. I considered a larger candle, hence a larger flame but thought, “Why?” as I stare at my small version. Wax builds up as the flame continues which can pose problems for the tiny thing that neither brightens or scents as the box described. 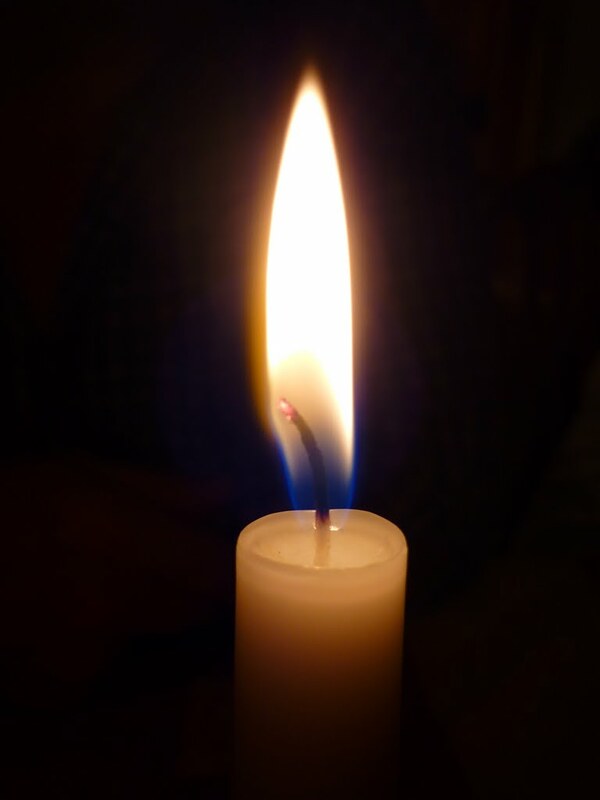 The surrounding wax can keep the tiny flame vibrant and alive but the same wax can also drown it. Without careful observation on my part the wax may extinguish my undersized flame. Interesting how the needed wax can also become the drowning wax. I need to keep the minute flame lit every minute I observe it. One flame. No scent in spite of the box description. No one around to comment, criticize, weigh or measure my kitchen flame or my momentary thoughts. Watching the heat-filled wax build up now so it doesn’t triumph. It’s my night. It is my single flame. I don’t mind that I miss the scent which the box promised. It’s my flame. And I enjoy it every single night. single flame: the pilot light of our lives that keeps burning through all times of life. scent: the promises of life are not always realized, real or imagined. wax: those who support and encourage you keep the flame alive and those who intrude and make you like them overwhelms the single flame. re-enactments: upon reflection we try to reshape made decisions, unmade decisions, missed opportunities and opportunities that went sour as though enacting them again will change the result. single flame: what gets us out of bed in the morning and lights the day ahead, allows a good night sleep to prepare us for the next day. This entry was posted in Spirituality and tagged spirituality, Thanksgiving. Bookmark the permalink.